If you have been visiting the Sylvia Plath Info Blog for any amount of time, you know that 24 August usually features something relating to Plath's first suicide attempt on that day in 1953. There are many posts "tagged" with "First Suicide Attempt". I'd encourage you all to click through these posts to see a history of the work I did on building a full bibliography of the articles that I have located. The post I had long intended for this year's anniversary was the announcement that I had transcribed all the articles that I had found to date. But I decided to post that on 1 January as I could not see sitting on that for most of the year. In the past, I have asked for help from readers of this blog to search through their local library's and university's microfilms to see if they can find missing articles. To date, no one has heeded the call. So... I am asking now, again, for some helping in building on the bibliography. 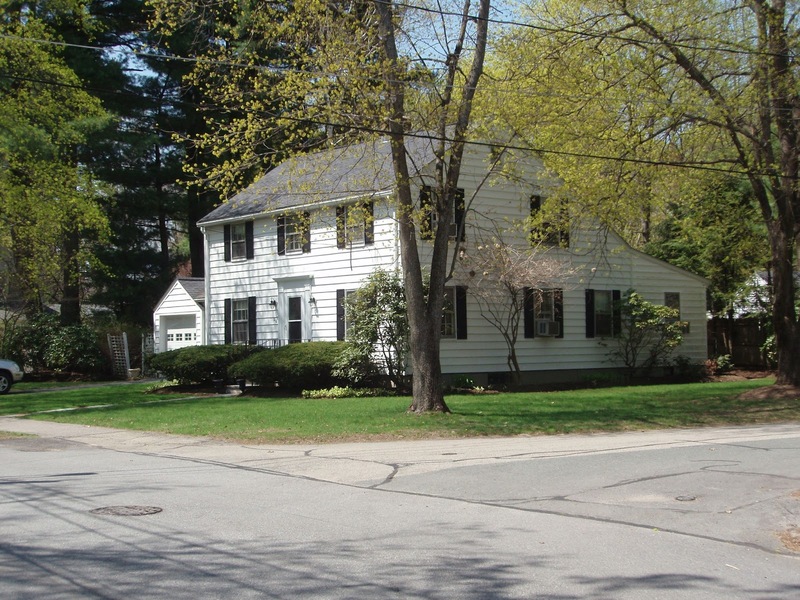 If you have any interest in what the house at 26 Elmwood Road is like, please do read the section of Chapter 4 "'A house redolent with ghosts...': Plath’s domestic and creative spaces" (pp. 93-99) in my book with Gail Crowther, These Ghostly Archives: The Unearthing of Sylvia Plath, published earlier this year by Fonthill. (Book Depository). All links accessed 17 August 2017. Vivian R. Pollak's Our Emily Dickinsons is a rich, intensely researched, and well written exploration of American women poets from Emily Dickinson to Marianne Moore to Sylvia Plath to Elizabeth Bishop. 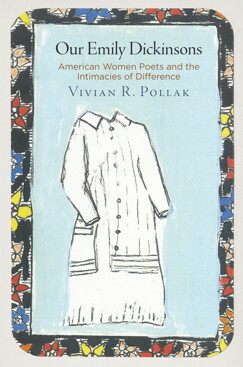 Pollak book takes "roughly one hundred years as its focus, Our Emily Dickinsons describes changing conceptions of Dickinson and the problem for women poets of being cut off from the social experiences which consolidate and affective community, however that community is defined" (8-9). The book also concentrates on other important figures in each of these people's lives such as Helen Hunt Jackson and Mabel Loomis Todd for Dickinson as well as significant family members and/or partners/spouses. These four main subjects share something like an heredity of female poetics. I enjoyed learning as much about the life of Emily Dickinson and the afterlife of her publishing history as I did in the introduction and first two chapters. The third chapter on Marianne Moore continued Pollak's examination expertly. It would have seemed more logical/chronological to me to put Bishop next rather than the two-chapter Plath intermission as strictly speaking Bishop should have been next up. However, by the close of the book the order of the poets discussed seemed a natural lineage. Chapter 4, "Moore, Plath, Hughes, and 'The Literary Life'", was first published in American Literary History in 2005. I loved it then, as I do again now, as I felt it probed into an overlooked and thus little understood relationship. Pollak's research was inspiring. And it remains so. Throughout chapter 4, Dickinson is all but absent, which left me wondering why this was included other than act as a to bridge Moore and Plath. However, Pollak explains Dickinson's absence in her conclusion which was admirable. The additional Plath chapter, "Plath's Dickinson: On Not Stopping for Death" appears to be new and written for this volume. Here Pollak "discusses Plath's early imitations of Dickinson and explores the roles of her mother, Aurelia Schober Plath, and of her husband Ted Hughes in shaping Plath's literary taste and posthumous reputation" (16). There is some content-overlap between chapters four and five with some quotes and points being repeated, and in general I dislike the use of the familiar "Sylvia", "Ted", "Emily", etc. and I found the end of chapter five, in a section entitled "A Queer Interlude" to be a stretch as a way to connect Plath to Bishop. Pollak's Our Emily Dickinsons is an original, convincing, and authoritative work on the life and posthumous publications of the mysteriously reclusive and enigmatic Emily Dickinson. Pollak explores reactions and responses to Emily Dickinson by three of the 20th centuries leading women's poets. 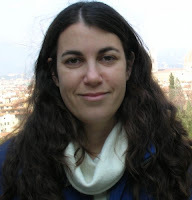 Pollak's work in and with a variety of archives, as well as her notes and documentation, is exemplary scholarship. There is no other book like it. All links accessed 12 August 2017. This is the second post in a series on the Education of Sylvia Plath and it reviews the courses she took during the 1951-1952 academic year. 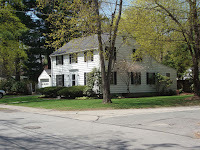 In Sylvia Plath's second year at Smith College, she roomed with Marcia Brown (later Stern), in Room 6 of Haven House. This room was on the middle floor of the house (2nd floor American, 1st floor elsewhere). Plath's room faced the Davis Student Center this year and the room had a bay window, a nice architectural feature. As with her first year, Plath carried six courses and received 15 credits (Physical Education did not earn her any credit). Using the finding aid to Plath mss II at the Lilly Library, I have added some of the papers that Sylvia Plath submitted for her courses. Her artwork I am unable to attribute at this time, an oversight for which I apologize. Plath's notebooks for Government 11 and Religion 14 are held by the Lilly Library. English 211: Literature of the Nineteenth and Twentieth Centuries. M T W 9. Miss Randall and Miss Drew. (71). See the other posts in the Education of Sylvia Plath series: 1950-1951; 1952-1953; 1954; and 1954-1955. All links accessed 2 August and 7 December 2017. Heather Clark, author of The Grief of Influence: Sylvia Plath and Ted Hughes (OUP, 2011) and The Ulster Renaissance: Poetry in Belfast, 1962-1972 (OUP, 2006), has been awarded a $50,000 2017-18 "Public Scholar" Fellowship by the National Endowment for the Humanities. The funds will enable Clark to continue work on her forthcoming, highly-anticipated biography of Sylvia Plath entitled Sylvia Plath: The Light of the Mind (Knopf). The award says many things but perhaps most important is the NEH's recognition of Sylvia Plath's status as an iconic American writer. Reports have appeared so far in The Washington Post and The New York Times. From The Washington Post, "Heather Clark won a public scholars grant to write a definitive critical biography of Sylvia Plath, which Knopf expects to publish in 2019." Heather Clark, CUNY Research Foundation ($50,400): "The Light of the Mind"
"A biography of American poet and novelist Sylvia Plath (1932-1963) that emphasizes her literary development and her important place in American letters." All links accessed 2 and 3 August 2017. Sylvia Plath's education was impressive. She attended grade schools in Winthrop and Wellesley, Massachusetts before matriculating with the class of 1954 at Smith College in Northampton. I have always wanted a single easy way to see which courses Plath was taking and when so as such I have made a series of blog posts on the subject of "The Education of Sylvia Plath". 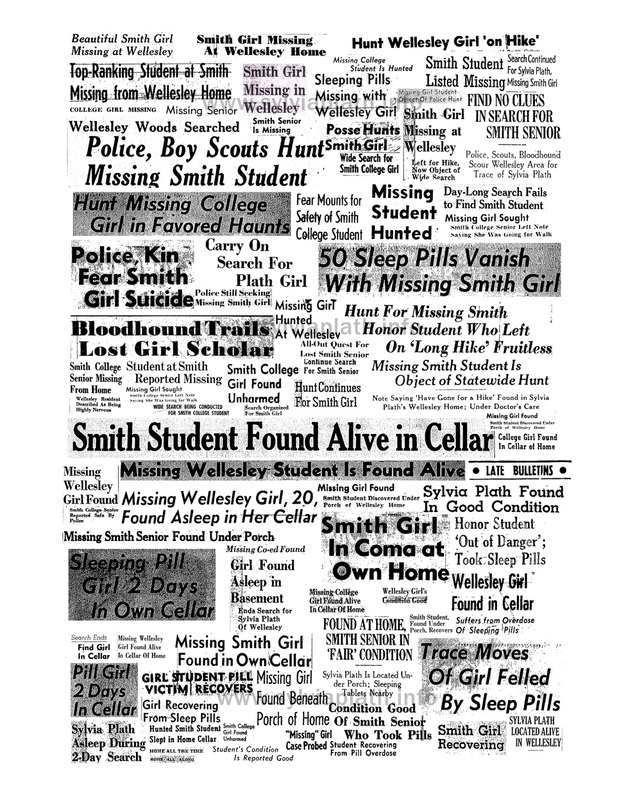 This is the first part, for her first year at Smith College, 1950-1951. Perhaps in time I can go a little further and do something like this for Plath's junior high and high school if the record is complete enough to reconstruct something meaningful. Using the Smith College course catalogs both in person and via the Archive.org, I have transcribed the courses from these sources that Plath herself would have read. They give an overview of the subject, but to read her notes and syllabi and papers would require traveling to the Lilly Library, Indiana University at Bloomington which holds the greatest number of these materials. 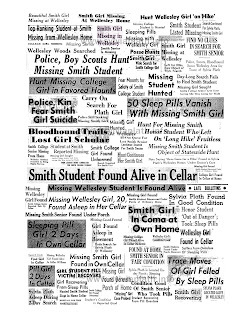 Smith College itself may have some syllabi in the College Archives. 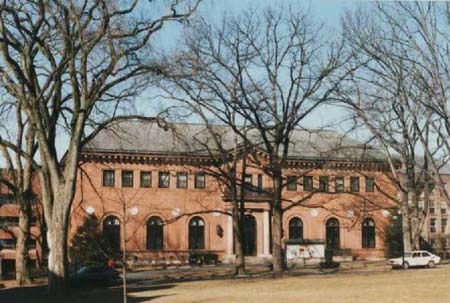 During her first year at Smith, Plath resided in the ever-yellow Haven House and made much use of the Neilson Library, pictured here. Under English 11 and History 11, I have added the dated papers Plath wrote for the course based on information from the Plath mss II finding aid held by the Lilly Library. Papers are held, along with Plath's notebook for Art 13, are held by the Lilly Library. Art: Art 13, Basic Design. From the course catalog: "The visual properties of color, light, volume, space, shape, line, texture through study of simple problems dealing with the nature of these elements, the use of materials and their creative application. For Freshman, Sophomores, and Junior transfer students. M 9; eight studio hours of which four must be T W 2-4, Th F 10-12, 2-4. Director, Mr Jules" (51). Botany 11: General Botany. From the course catalog: "A study of the life processes and structure of seed plants with emphasis upon their relationship to the needs of man. A survey of representative types of other green and nongreen plants; reproduction, heredity, evolution. Two lectures and two two-hour laboratory periods. Lee. Th F 12. Lab. A, M T 9; Lab. B, M T 1 1 ; Lab. C, M T 2; Lab. D, Th F 9; Lab. E, Th F 2. Miss Kemp, Mr Wright (Director), Miss Donahue" (55). English: English 11, Freshman English. From the course catalog: "Practice in expository and critical writing in connection with the study of selected literary forms. Members of the Department. Director, Miss Chase; Assistant Director, Miss Williams" (71). French 16: Introduction to French Literature. From the course catalog: "Introduction to French Literature. Choice of representative texts; literary, historical, and cultural background. Prerequisite, three units in French, 12, or 11d. M T W 9, 10, 11, 12; Th F S 9, 10, 11, 12. Members of the Department. (L)" (76). Plath had first registered for French 13 which was a course in "Reading, Grammar, and Composition. From the course catalog: "Prerequisite, three units in French, 12, or 11D. M T W 9, 12; TH F S 9, 10, 11. Members of the Department" (76). History: History 11, General European History. From the course catalog: "A survey of the history of Europe from the decline of the Roman Empire to the present. One lecture and two recitations. Lec. M 2. Rec. T W 10, 11, 12, 2; Th F 9, 10, 11, 12. Members of the Department. Director, Mr von Klemperer" (87). Plath was largely History taught by Mrs. Koffka. Physical Education 1a, 1b: Body Mechanics, Dance, and Sports.1 From the course catalog: "Three periods of one hour each. Required for Freshman. 1.A fee is charged for golf, riding, campcraft, and winter sports. Archery, canoeing, crew, golf, hockey, riding, soccer, swimming, tennis, volleyball. Individual Gymnastics. Miss Ryder, Miss Eddy. The Dance, modern and folk. Mrs Myers, Miss Horning. Badminton, basketball, bowling, children's games, fencing, riding, squash, swimming. Individual Gymnatics [sic.]. Miss Ryder, Miss Jennings, Miss Eddy. The Dance, continuing the fall course and new sections. Mrs Myers, Miss Horning. Archery, campcraft, canoeing, children's rhythms, crew, golf, lacrosse, riding, softball, swimming, tennis, volleyball. The Dance, continuing the fall and winter courses and new sections. Mrs Myers, Miss Horning" (111). See the other posts in the Education of Sylvia Plath series: 1951-1952; 1952-1953; 1954; and 1954-1955. All links accessed 19 June 2017, 31 July, and 7 December 2017.